Is the spirit of the Holidays this weeks Bath Inspiration is one of only a very few Holiday Bath Inspirations I could find on the web. I had hoped on bringing lot of nicely decorated bathrooms for the holidays and went to all my usual sources for Bathroom Decor Ideas and Nada, Nothing, Zilch! I am resourceful and with a little more research I finally found a few. This one is a winner! It comes from one of my favorite home decor sites - Houzz - and I think I've seen it on Pinterest as well, so others must like it also. It (I think) come from the design company that did our Rustic Bathroom (below) that has been wildly popular with all of you! 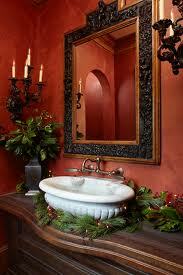 It does have the similar rich deep red colors along with a dark beautiful crafted wood mantel and accents. The holiday accents are so tasteful and low key, but at the same time spectacular in the way the garland is woven around the sink and back wall. The wall color couldn't be better for the holidays either! I'd love to say that anyone could recreate this look but let's face it - the wall color and woodwork in this powder room are gorgeous to begin with and gives it that holiday color without any decorations at all. That being said however, there are some of the elements in the room you CAN recreate. The garland idea is one and anyone can do as well as adding some of the color to the room with deep rich bath linens and rugs. The candles can also be added on the counter-top along with adding a vass of holiday greenery for height. If you would like to go to just one page and see ALL of our products that would work well for the Holidays - we have added the Holiday Bathroom Inspiration photo to our Shop by Design category (HERE) and listed below are all of our bath products that either by Color or Design work well during the Holidays in your bath or powder room. We will also be running a contest soon to find more Holiday Bathroom or Powder Room Photos to post... stay tuned for details in our Store News but start looking or decorating and taking photos of your bath because there will be PRIZES and GIVE-A-WAYS involved as well! This week's new addition to our BATHROOM DESIGN GALLERY is the Montana Mountain Retreat. 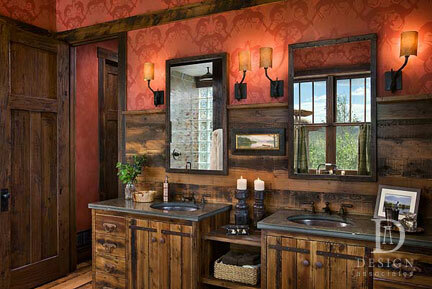 This bathroom is a stunning example of Rustic Design in which warm colors and natural materials dominate. Our featured bathroom inspiration comes straight from the mountains of Montana where it's designers and owners presently reside. Our hats off to them for showing us this outstanding example of how "Rustic Design" can be done in an elegant and luxurious manner. No detail in this bathroom was overlooked. Everything down to the door and the floor say Rustic! The warm tones, natural surfaces, dark fixtures, and simple accessories give this room the warm, cozy look that one would expect to see in any luxury mountain retreat. The red wallpaper and dark wood siding blend seamlessly with the dark counters, sinks and fixtures. Even the barn-style door complements the over-all design. This bathroom is the complete opposite of the bright and airy style bathrooms that are so popular right now but it certainly demonstrates that there are other design alternatives that are just as attractive! To achieve a rustic look in your bathroom use darker colors, wood furnishings and natural materials wherever possible. Natural material counter-tops, dark fixtures, colored bath linens and simple bath accessories are ways to introduce the rustic elements to your room. A pop of color can be added to provide contrast to all the dark tones with the use of wallpaper, paint, bath linens or accessories. A hint of white or a other light color with the use of candles, light fixtures or bath accessories - adds some light to the overall dark design. If you LOVE Rustic Design or live in the Montana area, see more similar designs at Design Associates Interiors, the design firm that created this stunning room and a whole lot more.